This is the first of a series of post that I've been working on while I wait to get back to school. It's in the same spirit as my very first blog post, “Envelopes and Astroids,” except it has fewer calculations and more hands-on work. I love that it is an arts and crafts project anyone can do but is rich with hidden mathematics. I will briefly mention and reference math connections that I find interesting but for the most part leave them as exercises for you to follow up on. The ideas will range from the isomorphism problem (this post) to the orientability of surfaces (next post) to the curvature of curves (third post?). I hope you'll find this as fascinating as I did. I first started making these as a kid when I failed to build functional kites. After a few failed kite-making attempts, I'd have a bunch of sticks and yarn and I'd just start playing with those instead. Start wrapping the yarn around the sticks moving from one segment to the next and before you know it, you have a kite! Just like the previous failed attempts, this kite doesn't fly but at least it looks pretty. Turns out this is known as an Ojo de Dios (God's Eye). It is a spiritual object for the Huichol and Tepehuan in Mexico; their designs are larger and use multiple colors to weave really beautiful patterns. I don't know much about the ojo de dios and its history but you should definitely google it if you're curious. Out of respect, I'll refer to my rather bland pieces as kites. So back to what I was building. Even if you're just weaving around two crossed sticks to form a diamond shape, there's a lot of choice you end up making that determine what the final kite will look like. For example, assuming you're looking down at the sticks, each time you wrap the yarn around the sticks, you have a choice of whether to go over or under the sticks. Also, since one stick is over the other, then it matters which of these two sticks you choose to go over or under. This all sounds complicated but the following images should help understand what I mean. In these images, I pretend the yarn is an annulus (a disk with a hole in it, like a CD) that is being glued to two crossed sticks. Exercise 1. 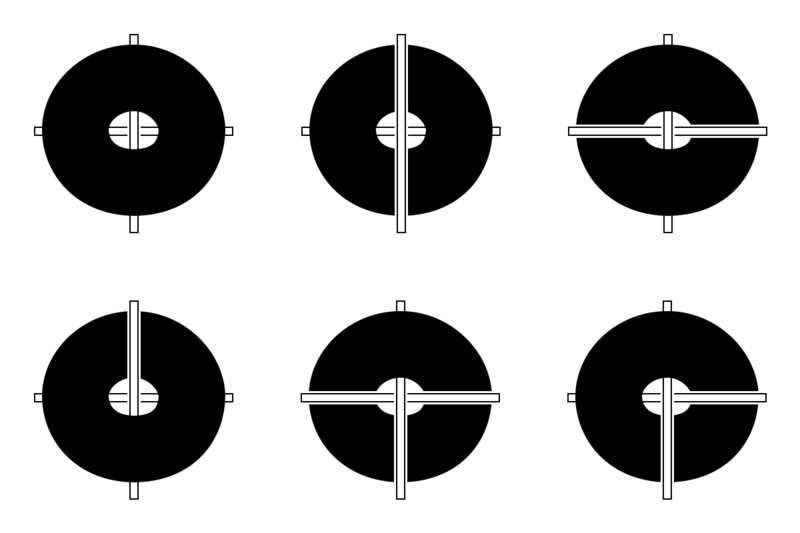 Did my images above cover all the different ways the annulus can be glued to the cross? If not, how many are missing? Naively, you could say there are 4 segments of the cross and, at each segment, you have 2 choices: to either glue above or below the segment. So there should be \( 2^4 = 16 \) different configurations. You need to be careful because some of these configurations may “look different” but rotating or flipping1 one gives you the other. But I don't want to count rotations/flips as different designs. So to answer my exercise, you'd have to see if you can rotate or flip my examples to produce any others that seem to be missing. Here are the kites represented by two of the models. On the surface, the exercise is a counting problem but when you dig deeper you realize it is asking if you can figure out when two images that look different are actually different perspectives of the same thing. This comes up a lot in mathematics and is known as the isomorphism problem. It is usually a difficult problem to solve since the two “perspectives” can be so different that no connection between them can be found. It shouldn't come as a surprise that a whole field of math, knot theory, was developed just to answer general versions of my exercise. For another example of how difficult isomorphism problems can be, the graph isomorphism problem asks whether two networks have the same structure. The following image illustrates how the same network can be visualized differently. It is from a Quata article published a year ago when an algorithm that solves the problem was announced. You can read more about it here. This brings us to another isomorphism problem, we can show that \( S \cong \mathbb Z_4 \). This means that the symmetries of my kite have the same group structure as the integers modulo 4. To truly appreciate this, let \( 1 \) represent rotating \( 90^\circ \) clockwise. Then \( 2 \) would be rotating \( 90^\circ \) clockwise twice, i.e., rotating \( 180^\circ \) clockwise. What does \( 2+2 \) mean? It means rotate \( 180^\circ \) then again rotate \( 180^\circ \). If you try it out with anything, you'll notice this brings you back where you started, i.e., \( 2 + 2 = 0 \). Being able to show that \( S \cong \mathbb Z_4 \) means you (sort of) fully understand what the symmetries of the kite are since the integers modulo 4 are well understood. Exercise 2. What are the symmetries of the other designs from Exercise 1? Are there designs with no symmetries at all (apart from the trivial one)? Are there different designs that have the same symmetries? Symmetries with the same group structure? Of course, the annulus model I gave earlier doesn't really cover every kite design possible. For starters, it assumes once you've chosen to wrap over a segment of the cross, then you will always wrap over it. But you can also mix it up by alternating between going over and under on the same segment to produce new kite designs. It does, however, take a bit more care to keep the results as neat as before. 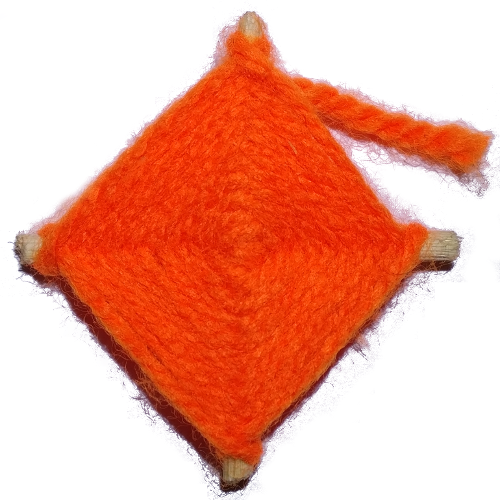 Here is a kite where the sticks are sandwiched between a self-intersecting sheet of yarn. For kites, you never have to worry about how much yarn you need for a particular design. You can just unwind the yarn as you go and only cut it when you're done. Exercise 3. Suppose you must cut the yarn before you started, you want to minimize how much yarn is wasted, and you want to make your kite out of 5 “rings” of yarn, how much yarn would you need? What if you wanted to have 10 rings of yarn? 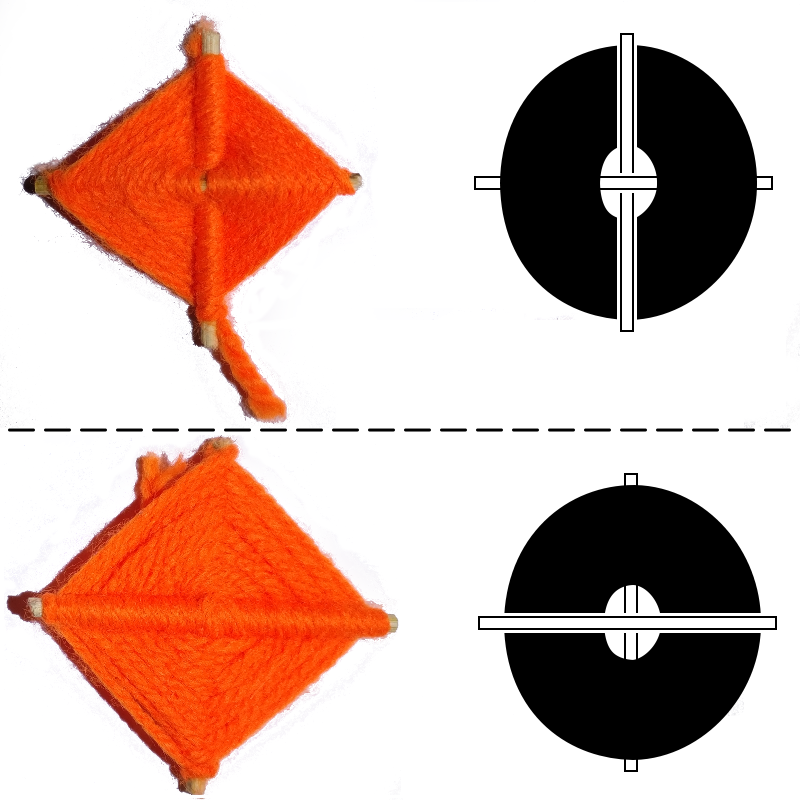 You should notice that when you double the number of rings, then you double the perimeter of your kite but the amount of yarn will more than double because all the new rings being added are longer than the previous ones. You can think of the length of the yarn needed as being the area of your kite. In two dimensions, doubling the size of an object will double its perimeter but quadruple its area. In general, this relationship is described by an isoperimetric inequality. The inequality answers the question: if you knew how long the outer ring had to be, how much yarn in total would you need? I didn't bring this up just as a curiousity; the relationship between perimeter and area is actually very important in my area of study, geometric group theory, which is (more or less) the study of symmetries. The exercise is also relevant to this project because I will need to cut the yarn before weaving around the sticks for the designs in the next post. This means I need to estimate how much yarn to cut but not overestimate because (set aside the issue of wasting yarn) the longer the yarn the harder it will be to weave around with it. I didn't actually do any calculations to figure how much yarn to cut. In practice, it meant that when I was doubling the size of my design, I knew I'd need at least quadruple the amount of yarn. The next post will discuss the mixed answer to this question: yes, I could weave a curve but no, I can not make an astroid. 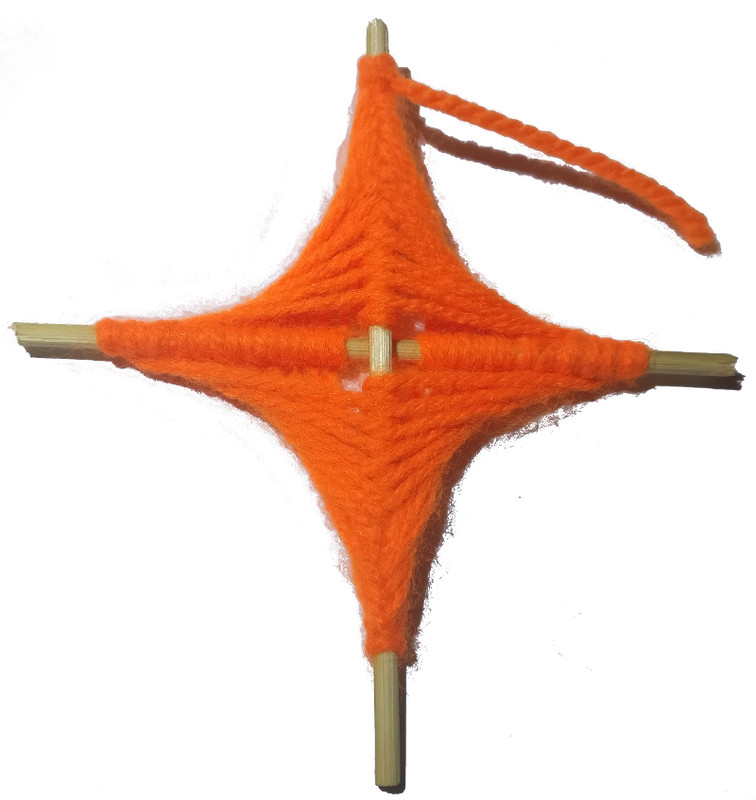 To see that that the kite above is not even an approximation of an astroid, look at the line segments formed by the yarn. In the GIF above it, the line segments are concentrated towards the ends of the axis and more spaced out at the center. However, in the kite, the line segments seem to be uniformly spaced out. This is enough to show that they are different curves and I'll leave that as an exercise. Exercise 4. Show that the two envelopes (colored curves) below are different. PS: This is yet another type of isomorphism problem. You're given two different constructions of curves and asked to determine if they describe the same curve.